WAIST HIGH: Happy 25th Birthday New Gold Dream (81-82-83-84). Happy 25th Birthday New Gold Dream (81-82-83-84). 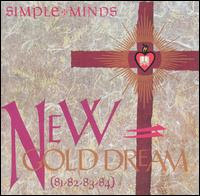 Recorded in the summer of 1982, Simple Minds' fifth studio album and Waist High favorite New Gold Dream (81-82-83-84) was a significant turning point for the band; critical and popular success in the UK and Europe finally intersected. With a slick, sophisticated sound thanks to producer Peter Walsh, Simple Minds was soon categorized as part of the 'New Romantic' outgrowth of New Wave. The record includes the classics "Someone Somewhere In Summertime," "Promised You a Miracle," "Glittering Prize," and "Colours Fly And Catherine Wheel." In addition, Herbie Hancock performed a solo on the track "Hunter and the Hunted." "Most of America only came to know Simple Minds a couple years after they hit their gorgeous peak on this album. This album will stand up as a timeless classic of the 80's, for even the synthesizers are lush-sounding and production is immaculate." "One of the most brilliant albums of all time."